Glitter accent manis are still a thing right? Good, because I can't get enough of them! I've been thinking neutral lately, so I went with gray, then added a little sparkle to the mix! I've been craving a gray manicure for a while now. I think I tend to gravitate toward gray for the same reason I like black nails in Fall and Winter. Just like black... gray nails add a little coolness and edge to my look, and they go with just about everything! 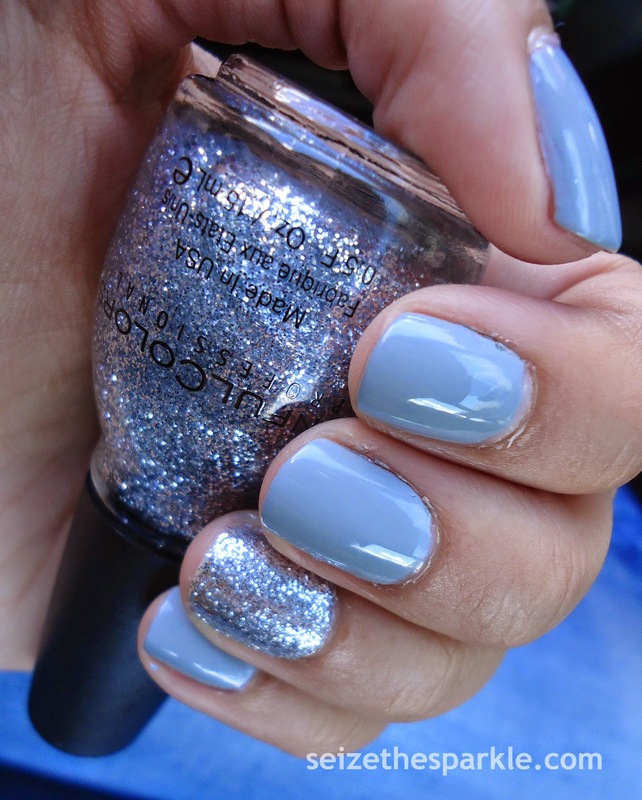 Silver & Gray... Gray & Silver... these two polishes were made to go together! I really like how this manicure turned out. It's perfect for any time of year, really. I could wear this for a little while, but you know me... already brainstorming the next one!!! This manicure definitely was not what I set out painting the other night... I had a completely different contrasting polish as my accent nails, but it just wasn't working out. I didn't think it would need a base coat, but it definitely did, and the color scheme didn't mesh with Tropical Punch all that well. So, I started over on the accents and kept Tropical Punch as my main color. 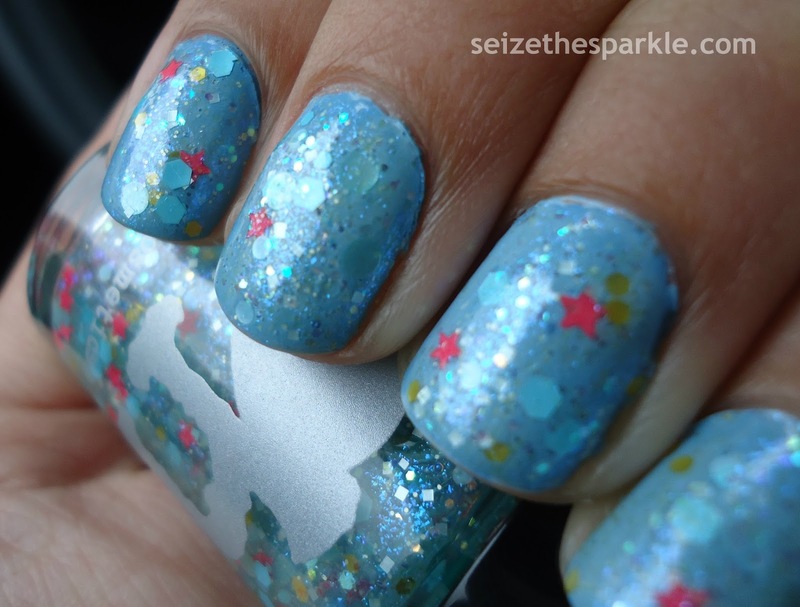 Now that I think about it... my nails are a mixture of this mani and this mani... just a different neon with good 'ole Rosie Lee. Orly Tropical Punch is a slightly warmer, more coral leaning neon pink than Va Va Voom. 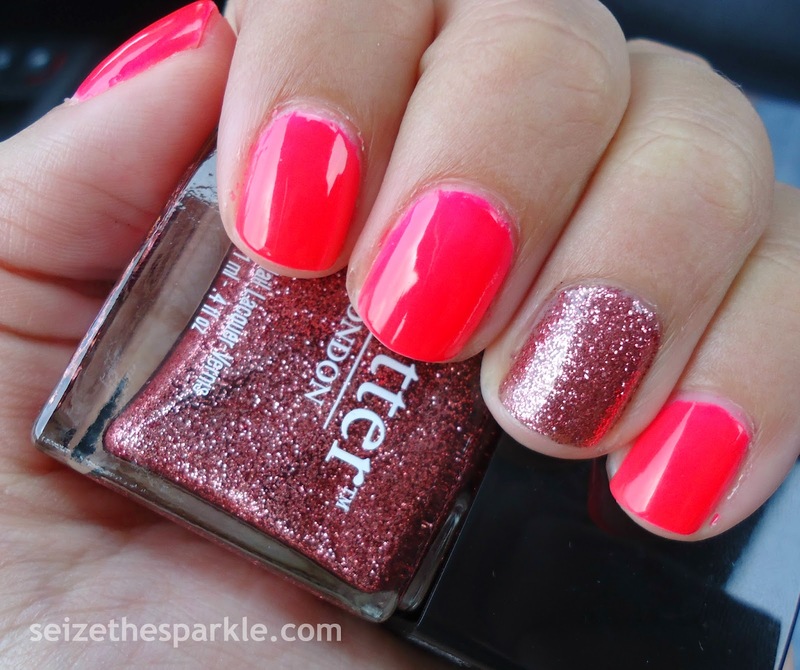 (Which I'm wearing on my toes...) Rosie Lee is a super-fine rosey pink glitter polish. The two definitely aren't matching pinks by any stretch of the imagination, and 2 or 3 years ago, I probably wouldn't have thought of wearing them together. But now? In the age of pattern mixing and working contrast... Rosie Lee and Tropical Punch make a fun combination on my nails. Application was great with both polishes, too. Three coats gave me complete coverage! I'm not sure why I'm so obsessed with neon pink lately... but I find myself painting my nails that color almost as often now as I paint them black during fall and winter. Yikes! So... I promise... the next mani I post won't be pink, neon, coral, or blue. Actually, there's a high likelihood of gray, considering I haven't worn gray polish in sooooo long, but, I've also been thinking about white and silver... Choices, choices! What do you guys think?!? Either way... I hope you have a fabulous weekend!!! 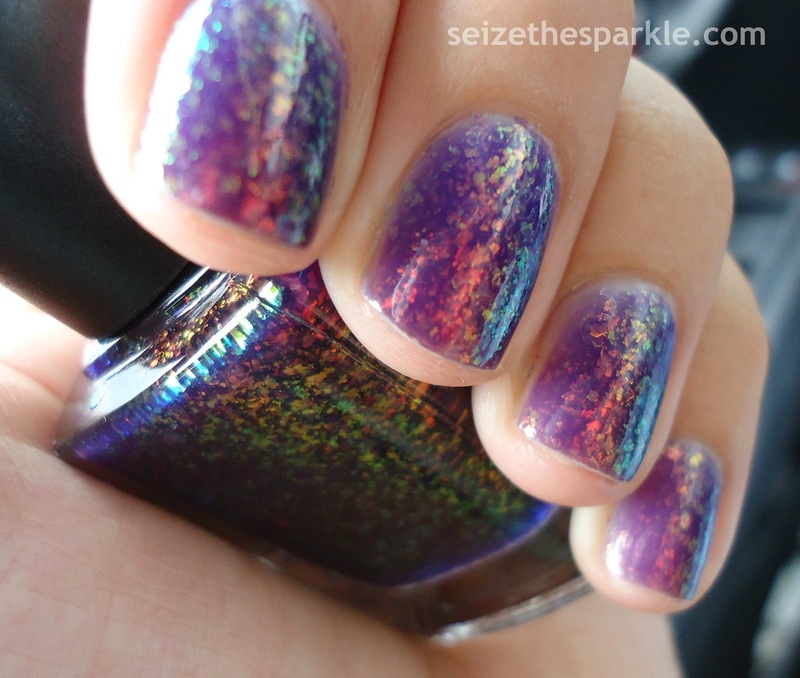 Flakies in nail polish are one of my favorite things. 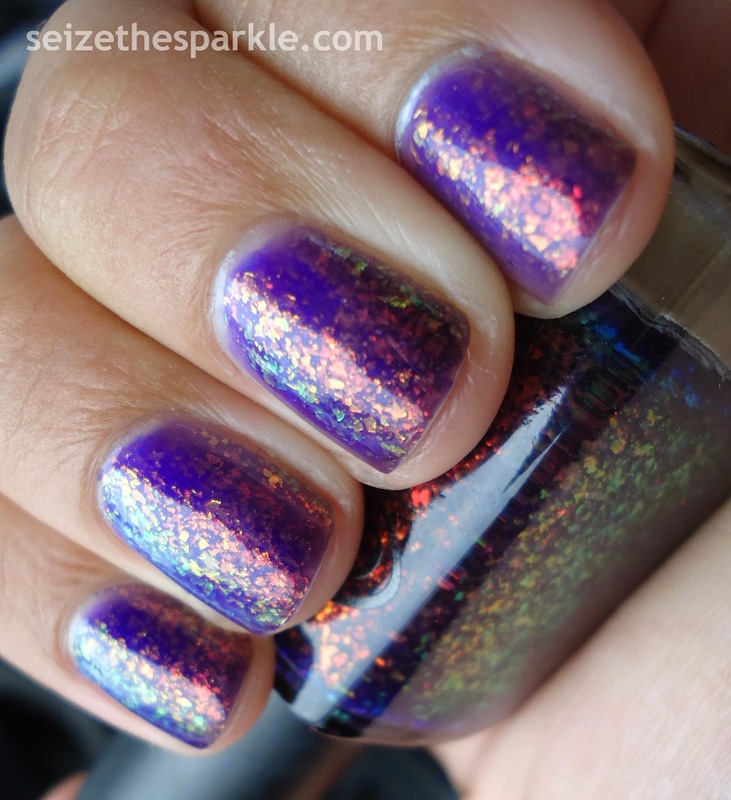 Especially bold flakies that flash through the colors of the rainbow like the ones in The Uptown by Color Club. 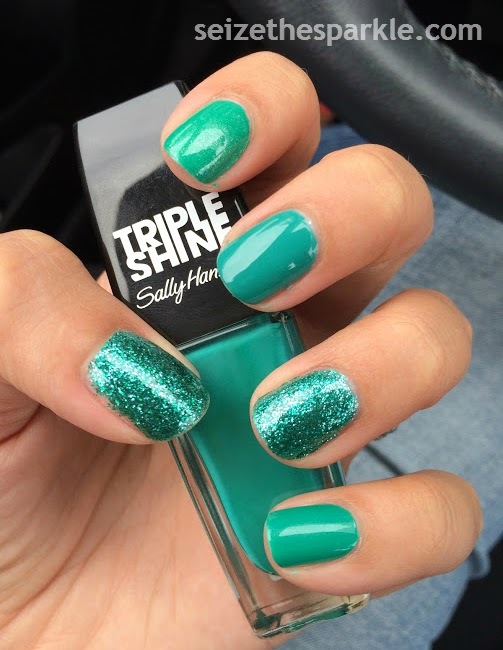 I was unaware of flaky polish until I started reading nail blogs. Like many other polish enthusiasts, the first flaky I truly longed for was #51 by Nfu-Oh. I considered purchasing it many times, but didn't get around to it until it had been discontinued. Major sad face. 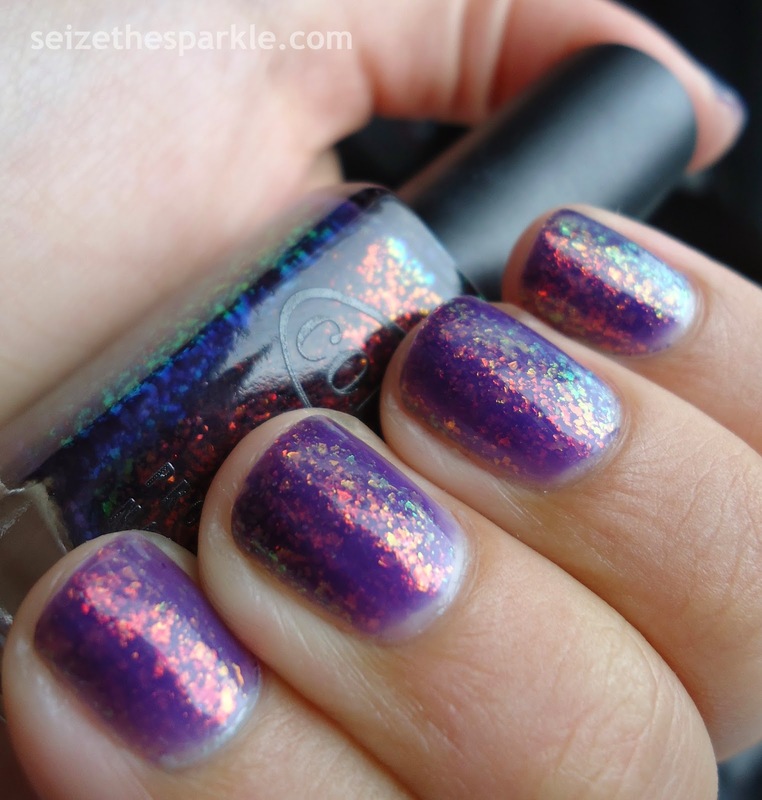 BUT... Color Club came out with The Uptown last year, and the polish world went ca-razy. You can't really say that The Uptown is a dupe for Nfu-Oh, because they're similar, but not exactly the same. 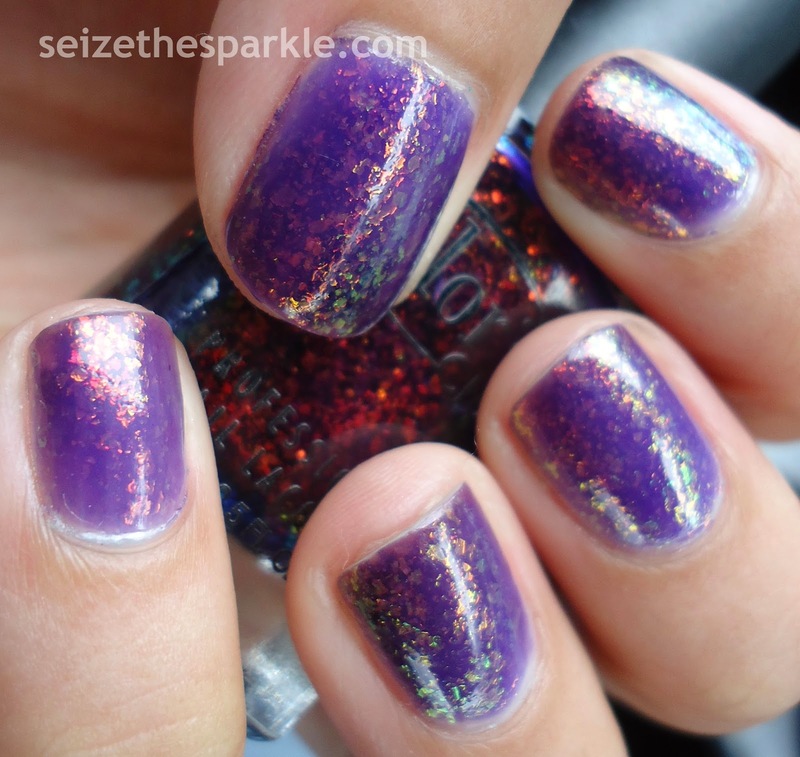 From pictures I've seen, The Uptown has more densely packed flakies in a slightly more blue-leaning purple jelly base. Application was ah-mazing. I've had different experiences with flakies, so I'm never sure what to expect. Three coats that went on smoothly and easily. I thought The Uptown looked a little dull after 1 coat of clear, so I added a 2nd coat for more shine, and then a coat of Seche Vite to seal everything in. I'm seriously loving this color right now... so much so, that this is the 2nd day I've had this on my nails. So far so good! 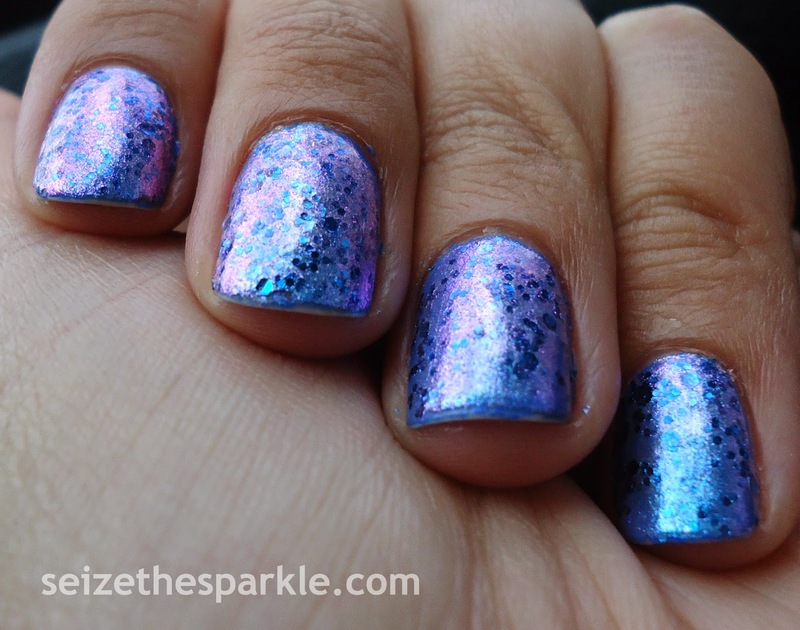 I'm totally envisioning a lot of different ways to layer this polish... because you can never have too much sparkle! It's Wednesday and I'm wearing pink again... I swear, I am not trying to make this a thing, really! It just so happened that the two of these were new and unswatched, and they go together so well, don't you think? Me too! You're Crabby is part of the Sally Hansen Electric Summer Collection, of which I had to purchase all 9 polishes. It's a great set of pastels and they're really nicely pigmented and everything... but I still needed 3 coats of You're Crabby to get the results you see in the pictures. There were definitely still visible streaks at coat 2, but the 3rd one evened everything out nicely. 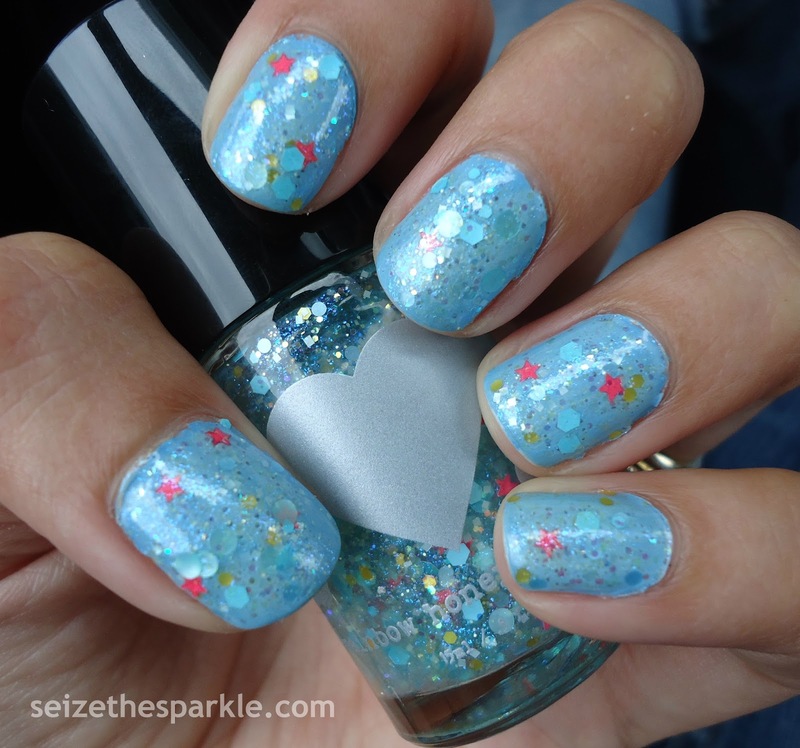 Rainbow Honey describes Sea Star as follows, "a coral starfish mix and mingle in this sea of aqua, light blue, and irridescent glitters." 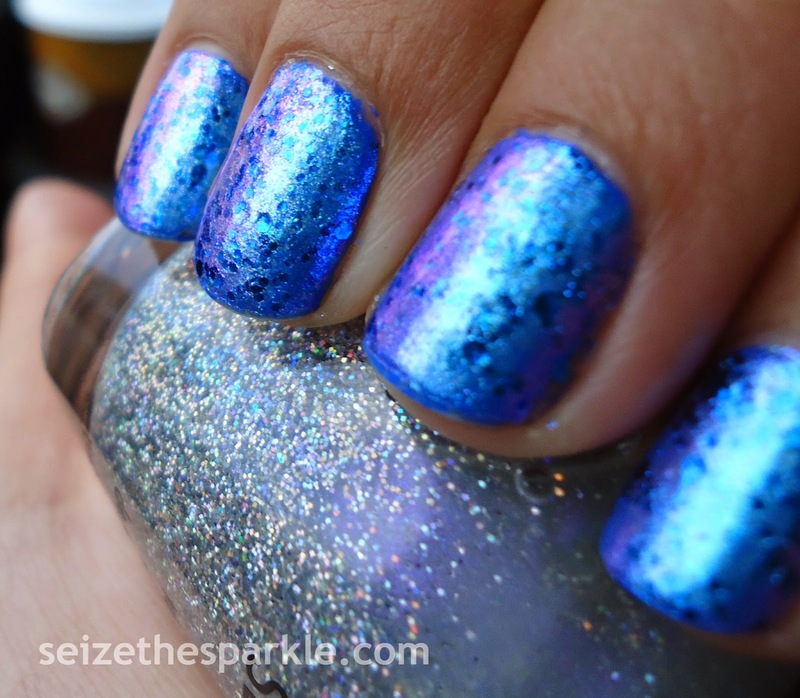 There's a little bit of every kind of glitter in here, and it is sooooo well-balanced. 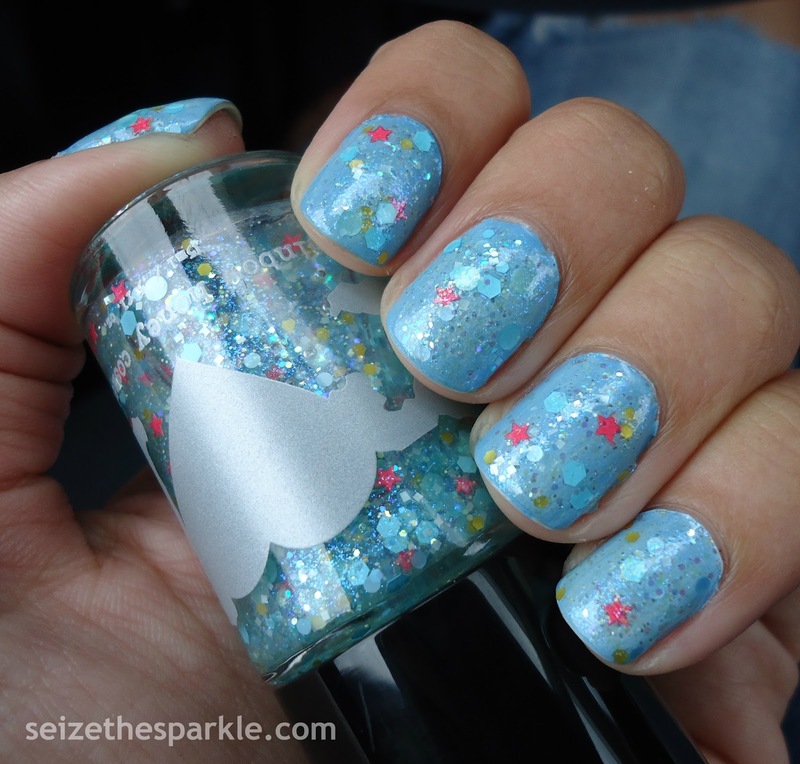 At off angles, the iridescent glitter looks like tiny air bubbles you'd see in an aquarium, the lighter satin glitter reminds me of opalescent sea-shells, and the coral star-shaped glitter adds just the right punch of color and fun! For my base, I used Revlon Tropical Rain... a mid-toned blue with a pearly blurple shimmer. (didn't really come through in the pics...) On top of that, I applied Sally Hansen Wet Suit very, very, sparingly, using the "distressed" method I also tried here. 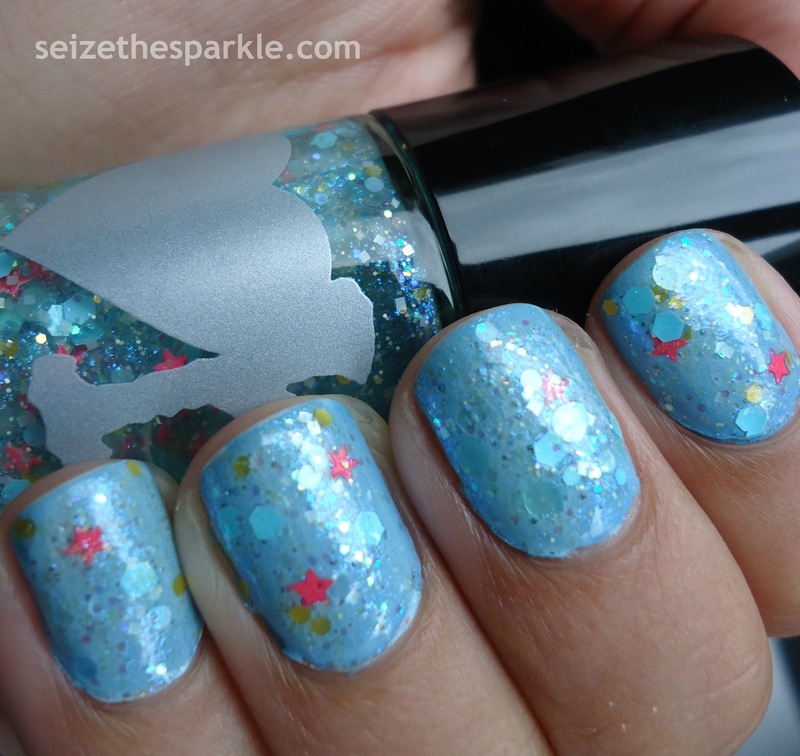 The idea was to have my base be a random mash-up of Tropical Rain and Wet Suit, allowing Sea Star to really shine, but also giving the mani just a little bit more depth. All in all, I'm really happy with how this layering turned out... and I'm curious to see how Sea Star changes as its layered over different colors! I think a tan or white would be really pretty... OPI Samoan Sand and China Glaze Dandy-Lyin' Around come to mind... 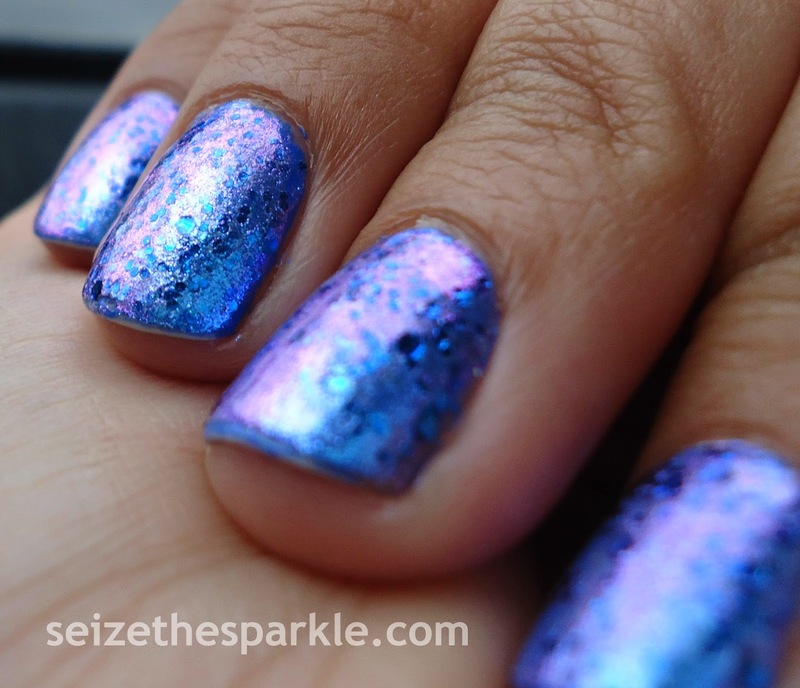 I also think this could look really cool over a bright coral polish. 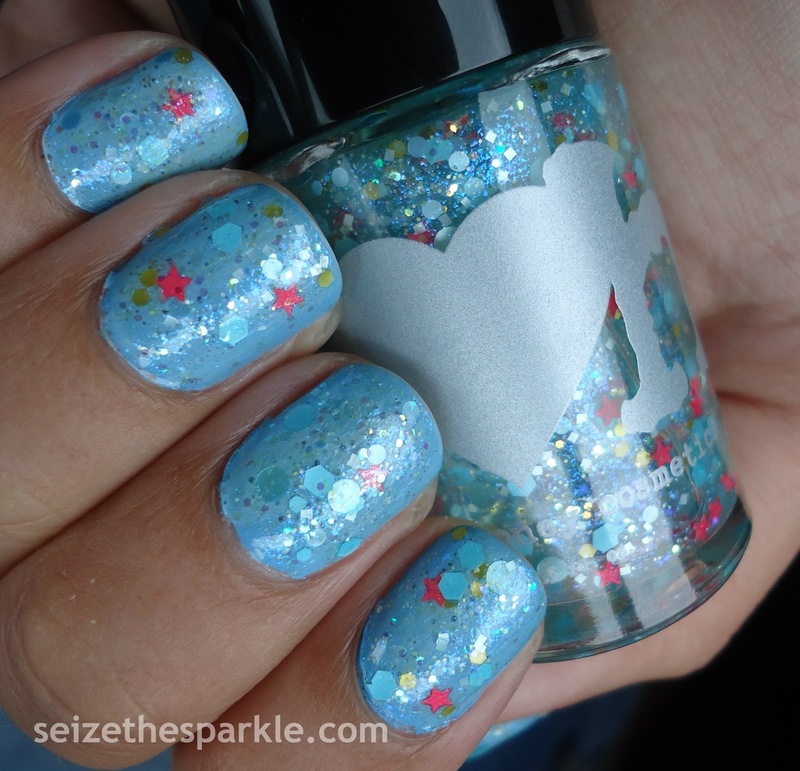 How would you layer Sea Star? If the caps look a little wonky... it's because they are, but for good reason! Each cap houses a built-in LED light for super-easy application. I found it more distracting than anything, but I guess it could be a novelty for some? Anyway... I was drawn to Sweet Tooth, because... well, even in the promo pic (front row center) it just looks gorgeous! 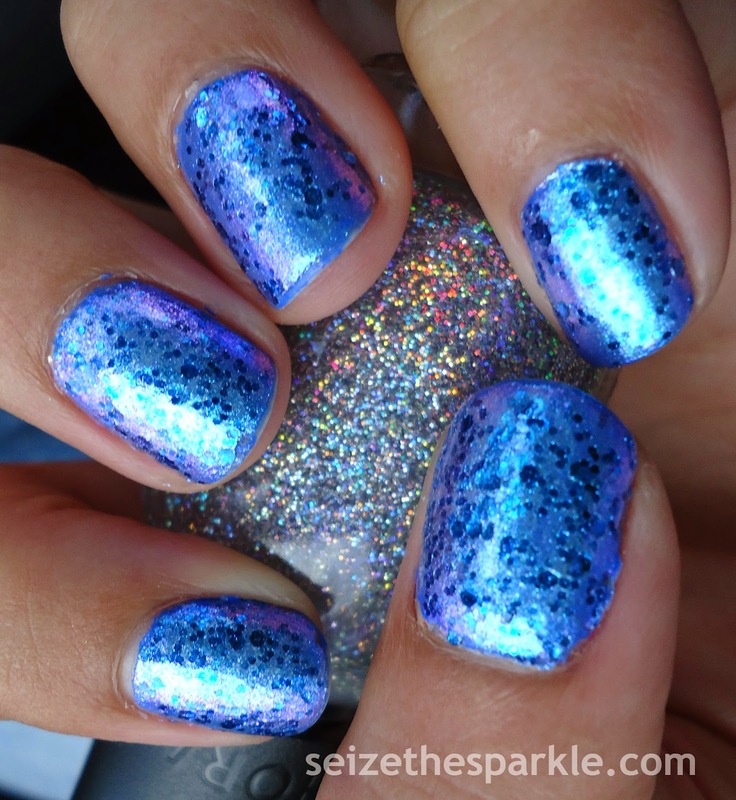 It's an irridescent blue that shifts purple that is brimming with small and large blue hexagonal glitter. It absolutely glows! So... why the base coat? Well, I painted on 1 coat and remembered that irridescent sometimes also means sheer. That's definitely the case with Sweet Tooth. No biggie, I just started over, using 2 coats of Ocean Blue from the NYC City Samba Collection. 3 coats of Sweet Tooth later, my nails were super-sparkly, and ready for 2 coats of Big Shiny Top Coat and 1 coat of Seche Vite. Application-wise, the Cinapro polish was waaaay easier to apply than the NYC. I think that's because the NYC was a quick-dry, and I'm not so good with those. They never feel like they really dry faster, they're just a little trickier for me to apply without getting all kinds of lumpy bumps. 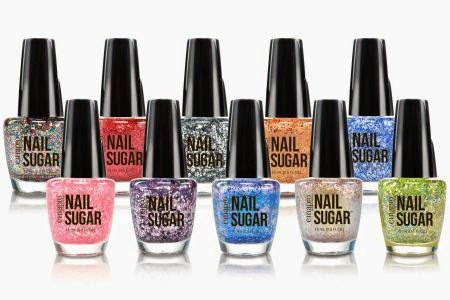 In addition to Sweet Tooth, I also picked up Sugar Rush (back row, first bottle), a multi-color glitter polish that reminds me a lot of the glitter in OPI More Than A Glimmer, minus the matte finish! I'm really excited to try that!!! Price-wise... these were a little spendier than I normally like... $8.49 a bottle, same price as the OPI shades at Sally Beauty. I could do without the light in the cap for a lower price point. At the same time though, the colors in this collection feel really unique and original, and the formula is good, so... it's kind of a toss up. Guess it just comes down to what you're comfortable spending. Luckily for me, this was a gamble that turned out well! 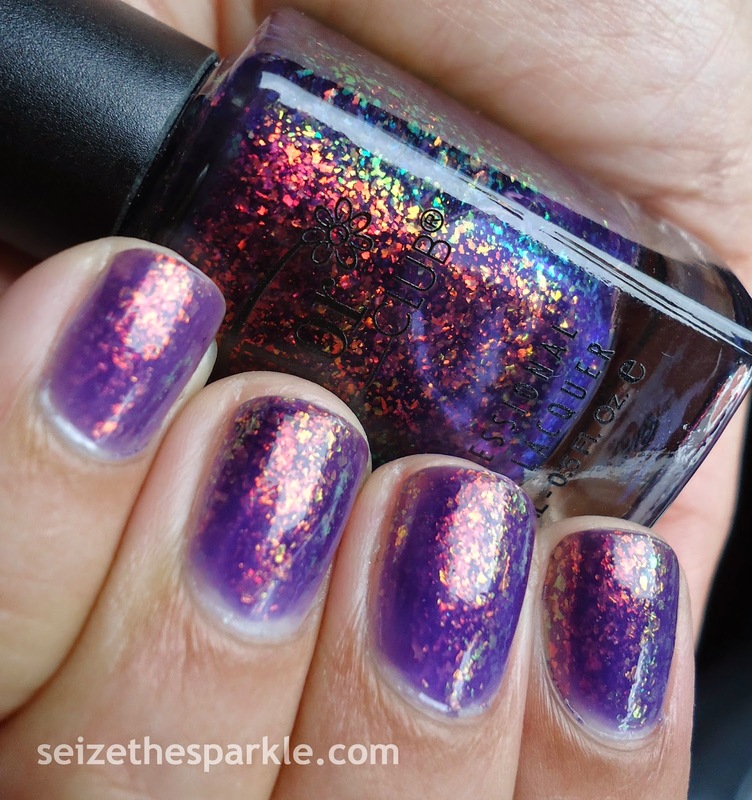 What do you think of Cinapro polishes?